..: History of 446 Mhz band. In 2001, the PMR446 band was created to replace the RPS band which included three frequencies, which are also housed in the 446 MHz radio band. The PMR446 band consists of 8 analog channels distributed on the section 446.0 to 446.1 MHz. More information in this Website about PMR446 . In 2007, it created an extension at the PMR446 licence free band, it's a section that will be dedicated to the DMR, from 446.1 to 446.2 MHz which is also licence free in Europe. Since we have a single radio band from 446,0 to 446,2 Mhz in which are all licence free bands in UHF, analog and digital. ..: DMR ? What is it ? DMR (Digital Mobile Radio) is the name given at all digital transmissions of voice and data available in VHF / UHF professional radio bands. These have been designed and implemented by ETSI *. These transmissions permit the transport of voice and data simultaneously on a single frequency. The DMR is available in several versions (called "Tier") that offer an options panel according to the needs of users. Simple, it includes FDMA transmissions (Multiplexing of voice / data channel by the divison into two separate parts (it cuts 12.5kHz channel into two narrower channels of 6,25hz each) and unlicensed. The max transmit power is limited to 500mW and the antenna must be indissociale because that is what this Tier consolidated all communications digital PMR446 band (dPMR446 and DMR446). It must comply with the technical specifications of ETSI. See TS-ETSI-102-490 . 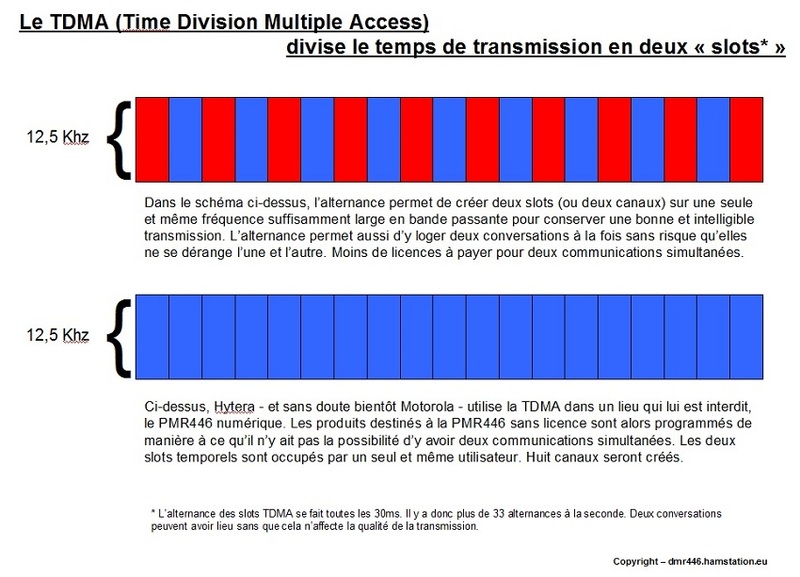 It is allowed only on frequencies with licenses because it works in TDMA, a multiplex voice / data by dividing the transmission time into two parts. Relay creation is possible. We will discuss the TDMA in the next paragraph because it will interest us. It is used in the same manner as the Tier II but allows the use of several frequencies between 60 and 900 Mhz. Complex SMS. The relay creation is possible and the use of relaying via IP4 and IP6. ..: So, DMR446, What is it ? The DMR446 is the combination of the quality of digital voice communications in PMR446 band license free. As stated in the first paragraph, the DMR446 band has been allocated for the moment on the second part of PMR446 band, between 446.1 and 446.2 MHz. Work is under consideration with OFCOM to correct the law and adapt the text for that whole PMR446 band (446,0 to 446,2 MHz) will be authorized in digital and analogue transmission. We have to wait up to January, 1st 2018. We had red that only the digital Tier I was allowed ONLY in the PMR446 FDMA band. Also, for comply with, manufacturers have adapted to the law and have created handheld capable of supporting digital voice or data over a smaller bandwidth (6,25Khz instead of 12.5 kHz). Creating an efficient codec (AMBE+2). The first portable in FDMA and preprogrammed appeared around 2007 and had 16 channels spread over the 446 band from 446.103125 to 446.196875 MHz. Present time, they are still relevant and occupy the entire band spectrum as authorized shown in the table below. The devices were expensive and often they were incompatible with each other. Each manufacturer depositing its own codec or modifying AMBE+2 to make it a must that would require users to purchase all models in its own network. No standard therefore is actually differentiated. Manufacturer Hytera, taking advantage of its unique manufacturing line digital and wishing advantage of a potential Digital lucrative market for the general public. It has devised an alternative solution that would around the European law requiring transmissions FDMA. Indeed, the supplier of handheld and mobile products, very established in DMR market Tier II dedicated to professional, imagined to manufacture the first portable digital unlicensed (PD365LF, PD505LF and PD355LF) using this "prohibited" technology in PMR446 band. To do this, and in order not to create a special production line dPMR (thus FDMA), Hytera has adapted TDMA technology using the possibility of transmitting on the two slots at once (Pseudo-TRUNK mode). The problem was solved. Bandwidth as a whole (12.5 kHz) was used and the two slots communication (see schema at right). 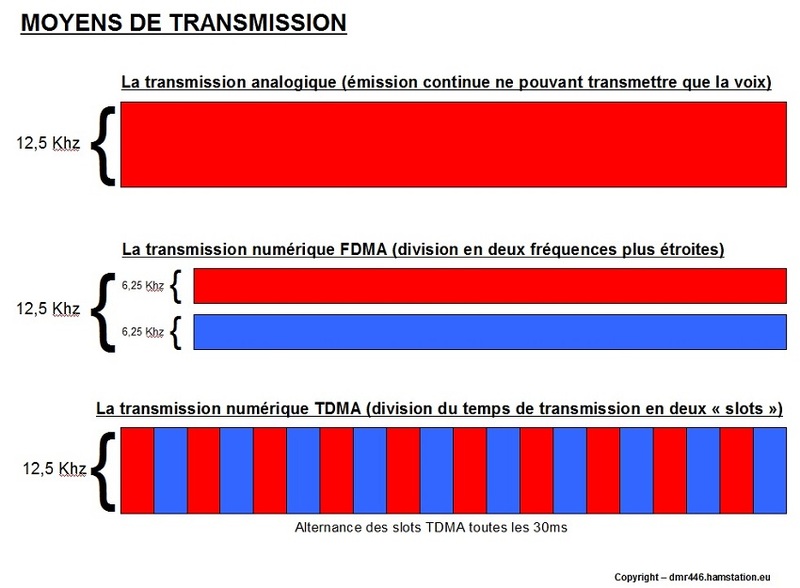 You can see differences between Analogic, FDMA and TDMA transmission. Hytera DMR446 licence free handheld will must be programmed in only 8 channels as reported in the table below. Other handhelds programmed with alternating slots, and thus on 16 channels, will work fine but they will not congruent to digital PMR446 standard. ..: Does DMR446 work better than analog PMR446 ? In the diagram below, you can notice that the sound quality of communication is optimal and continuous during the entire call, regardless of the distance and up to the ultimate limit the scope of the issuer. With an analog handheld, the quality of sound would have declined progressively until no longer be audible at all, and even if there were still some signal reception. when the signal is bad and near to cut. and in second time, we try the DMR446 Nb1 (446,106250 Mhz).